Key to a successful family reunion is the ability to communicate effectively with your family members. 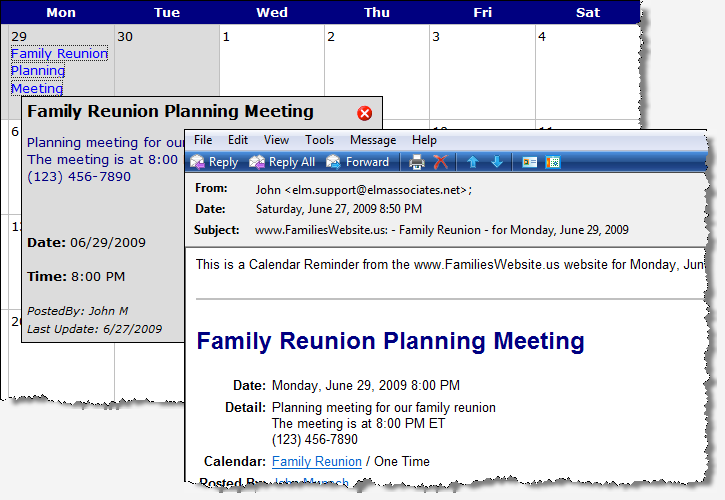 The Calendar included in your FamilyBelle.com site sends email reminders, prior to events and meetings. Our customers have reported significant increases in participation in their committee meetings and other events when the email notification option, on the calendar, is used. (see calendar below) Sign up now it's FREE! Keeping track of accurate contact information ensures successful planning for your family reunion. Over time families move and their phone numbers change. The Address Book allows family and relatives to update their own contact information on the website. This ensures you always have the most current contact information available. Security is a top priority, by default, only visitors who you create logins for can login and view the website. The address book is an optional feature which you can turn off if your desire. Again communication is paramount to a successful family reunion. The information maintained in the Address Book is also available in your User Manager console. From the console you can quickly send an email messages to every one you have created a login for. From the User Manager you can export them to Avery Mailing Labels, and if you would rather work from a family reunion roster, you can export to an excel spread sheet or an Acrobat PDF file. Collaborate on your family tree though the Genealogy tools included in your site. Anyone you create a login for can contribute to the family tree. Genealogy collaboration is fun and one of best ways to quickly fill out your family tree. You will be amazed at how much your family reunion will benefit from the collaborative process. This collaborative effort will keep everyone in touch far beyond your family reunion. Family Reunion committees typically need to create a budget for costs associated with the event. Once you have figured out how much the family reunion is going to cost, you have to determine how you are going to fund it. Charging an admission fee is one common way to fund a family reunion. Another way is to raise funds by selling family reunion related items and/or solicit donations. Your FamilyBelle.com site includes a shopping cart, it's perfect for selling t-shirts, caps, coffee cups etc. The shopping cart also supports donation buttons. Credit card processing is securely done though PayPal, all you have to do is open a PayPal account. If you don't already have a FamilyBelle.com website, Sign up now! its FREE.